New Ghana boss Avram Grant says the door is open for banned pair Sulley Muntari and Kevin-Prince Boateng to return to the national team. Both are suspended indefinitely for gross misconduct while on duty with Ghana at the 2014 World Cup in Brazil. But Grant, who was appointed last month, said: "The door is open for everybody, but there are criteria. "I'll respect the team and the players must respect me, too. I'll speak to the players and we'll see what to do." 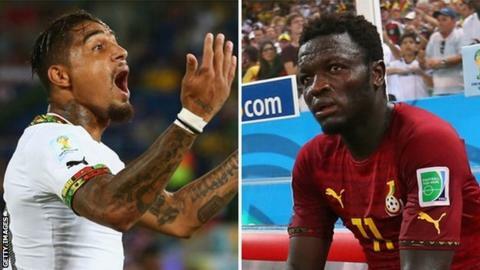 Muntari was punished for allegedly assaulting a member of the Ghana Football Association during a row over bonuses, while Boateng paid the price for what the GFA called gross acts of insubordination towards then-coach Kwesi Appiah. Grant added: "They need to show they want to come and want to play. But the national team is not a like any club team. Everybody needs to support it. The national team is more important than any individual." The former Israel boss, who was speaking on Thursday at his his first media conference since taking charge of the Black Stars, also revealed there could be a recall for Michael Essien. The midfielder has not been part of the squad since the World Cup, following accusations in some quarters of failing to warm up properly for the matches at the tournament. Grant, who worked with Essien when he was coach of Chelsea and with Boateng when he was in charge of Portsmouth, is keen to harness the country's top talent, especially given the difficulty of the group they have been drawn in for next year's Africa Cup of Nations. "It is not an easy draw. It is the group of death," said the 59-year-old. "They are very good teams. South Africa qualified unbeaten. Senegal are a good team. Algeria had a good World Cup. It will be difficult for us and difficult for the opponents," he said. "I have a short time to know the players. The target as far as I know is not to win the tournament in 2015, but I will do everything to win every game. I think the most important thing is to do well to build up the football side of the national team."